Whittington's Jerky Gift Baskets - APO Basket without a Basket! Designed for the soldier that we so frequently send our fantastic jerky to, the Basket without a Basket, still says you care but you know they really dont want the container, just whats inside. The perfect gift to send to a special soldier, or anyone you just want to show you care. 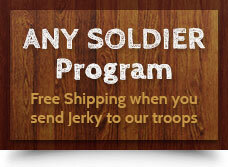 One pound total of Whittington's most popular jerky flavors and other special gourmet goodies. All securely packed in a box for easy shipping to our troops. * Whittington's Jerky reserves the right to substitue a comparable product in our Gift Baskets if a specific product is out of stock.